Knowing how to find the right welding gases for your specific application can make all the difference in your final product/output. Argon, helium, and carbon dioxide fall into the "pure welding gases" category. Using various ratios of each can create distinctive final effects on the welding arc. Knowing about each of these unique gases and their specific properties can help you determine the correct mix for your needs. If you still have questions about your specific Welding Gas needs; work with a qualified and authorized distributor. When choosing, remember that bigger isn’t necessarily better. A mid-sized welding gas shop will offer all of the same services, capabilities and amenities as a larger operation, but will have the ability to deliver personalized customer care. Best of all, working with an authorized dealer means that you will have access to the same pricing model offered by the larger corporations. 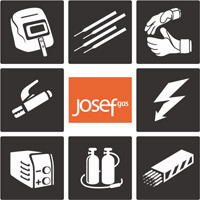 Want to hear more about how Josef Gas stands out from other suppliers? Contact our team and request a no-risk project quote today!